Today I found out Julius Caesar was once kidnapped by pirates and convinced them to up their ransom demand. He next delivered the pirates to the authorities at the prison at Pergamon and then traveled to meet the proconsul of Asia, Marcus Junius, to petition to have the pirates executed. The proconsul refused, wanting to sell the pirates as slaves and take the spoils for himself. Unhappy with this outcome, Caesar traveled back to Pergamon where the Sicilian pirates were being held and ordered that they be crucified under his own authority, which was subsequently done. Once again, the adage “Never go against a Sicilian when death is on the line” was proven false…. The original Caesar salad was not eaten with forks, but rather eaten with your fingers. Cardini would use whole Romaine lettuce arranged on a plate so that the stems were facing out and he would put all the ingredients on each leaf. You’d then just pick up the leaf and eat it that way with your hands. The original recipe also used coddled eggs and Italian olive oil. Another false “word origin” connected to Julius Caesar is that his name was given to him because he was born via a caesarian section. This is thought to be false though as this would have almost certainly been fatal to his mother (women didn’t survive caesarian sections in ancient times), yet she actually didn’t die until he was around 46 years old. Also, Gaius Plinius Secundus, better known as Pliny the Elder, stated that Caesar’s name came from “caesaries”, meaning “head of hair”. Julius Caesar and Cleopatra of Egypt were lovers for 14 years, but were unable to marry because Roman law stipulated Roman citizens were only allowed to marry other Roman citizens. 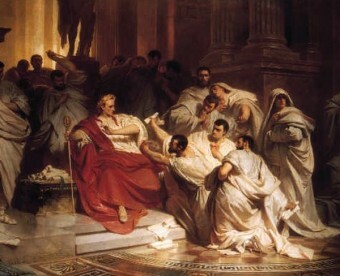 The group that sought Caesar’s assassination was no small one, as is sometimes depicted. Rather, it consisted of around sixty senators, most notably Gaius Cassius Longinus and Marcus Junius Brutus. The group proposed many ways in which they might kill him, but ultimately decided to do it when he was in the Senate, because only Senators were allowed in, so he would not have any guards with him. Their plans were soon in earnest because Caesar had decided to leave in late March for an extended period to try to conquer the Parthian Empire. Because the group was so large, whispers that an assassination attempt might occur reached Caesar and many of his friends and even his doctors told him not to go to the Senate on the day of his death. Unfortunately for him, one of his closest friends, Brutus, convinced him he should go. When he arrived, one of the senators pushed him to the ground and several of the conspirators sprang on him, stabbing him 23 times. Contrary to popular belief, Caesar did not say “Et tu, Brute?” (“You too Brutus?” or “And you, Brutus?”) before he died, as was penned by Shakespeare. That assertion has no basis in historical fact. Both Plutarch and Gaius Suetonius Tranquillus state that Caesar said nothing after the attack started. After the murder, those involved thought the people would be happy that a tyrant had been removed and now the Republic would be restored. Instead, most people were outraged, as Caesar had been extremely popular. In the end, rather than achieve their goal of restoring the Republic, their act spurred a series of civil wars that ended with the creation of the Roman Empire. While Caesar’s 18 year old grandnephew Gaius Octavian, later Augustus Caesar, was Julius Caesar’s named heir, Caesar actually had a son with Cleopatra, named Caesarion. Because his son was an Egyptian, though, he picked a different heir. It seems he picked well, as Augustus soon became one of the great rulers in history, creating an empire that would endure for around fifteen hundred years. The Rubicon that Julius Caesar famously crossed (which was an illegal act for a General to do, taking his soldiers into Italy proper) got its name from the fact that the water had a reddish hue from the mud in that region. Specifically, the name derives from the Latin “rubeus”, meaning “red”. Julius Caesar was born around July 13th (the exact date is somewhat up for debate) in 100 BC in Rome. Some have speculated that Marcus Junius Brutus, one of the leaders of the group that assassinated Caesar, might have actually been his son. Brutus’ mother, Servilla Caepiones, was Julius Caesar’s mistress for a time. Julius Caesar was kidnapped on two occasions by “Cilician” pirates. I can see how the mistake can be made with “Sicilian” and “Cilicia”, as the names are fairly similar to look at. Cilician pirates lived on the Southern Turkish coast and islands from Asian Minor to Crete. Cilician pirates would sack grain ships from Egypt and sell off the crew as slaves, often enough, to Rome and its provinces. Caesar salad was invented in Mexico and taste yummy with a margarita. I know that Mark Anthony made a big mistake in fighting a sea battle when Cleopatra tricked him. A poem I wrote after my return from Rome. The Ides of March has come and gone. And now the eastern wind is fast approaching. As I stood there looking at the ruins of that place. Where the brutal deed was executed. Historical records raced through my mind. I saw the gestures movements and heard the sounds trapped inside. Then there was silence for a very long time. When I went back that far in time. I could not help but wonder. Had he been there by his side that day. How different this world might be today. To what extent would the history books have to be rewritten. For that matter would the historian scribes this time around. Write the full truth without the fear of further reprisals. 3 or 300 what does it matter. 1 was far too many. I for one am tired of seeing battle fields. Littered with rows and rows of wasted crosses. Plato said only the dead have seen the end of war.